Encouraging, user-friendly, and altogether unique, Mosby's Tour Guide to Nursing School encourages you to not only survive nursing school, but excel in whichever program you select. 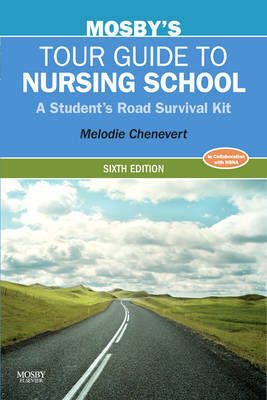 Throughout the book, Dr. Chenevert compares your journey through nursing school to a road trip, and she offers advice to increase your understanding, help you successfully navigate obstacles, and make your journey more enjoyable. You'll learn how to prepare for the NCLEX and your nursing career, how to get good grades, how to deal with failure, how to improve oral and written reports, and much more. A must-have for every nursing student! Endorsed by the National Student Nurses Association (NSNA). Written by a nationally known motivational speaker and nurse, the book's down-to-earth approach uses humor and clever analogies to clearly teach the information you need to know. Uses the analogy of a cross-country road trip to help you see the relationships between different aspects of nursing school, as well as give you a finite view of its duration and end result. Inspirational quotes throughout offer wisdom and encouragement from fellow nursing students and graduates. The appendix lists numerous diverse resources you'll find useful before, during, and after nursing school. Electronic Age Information covers distance learning, online courses, and podcasts, facilitating your success both in today's electronic classroom and with the advancing technology in nursing. A special NCLEX chapter (Chapter 29: Are We There Yet? Almost.) provides you with the tools you need to prepare for and pass the NCLEX . Updated statistics and information on the emerging trends of the workforce keep you current with what's happening in the world outside nursing and help you make educated choices during nursing school. Three chapters are devoted to diversity in today's workforce and the non-traditional student. Thorough coverage of ADN, BSN, and RN-BSN programs (program prerequisites, differences, and more) helps you make informed decisions about your choice of nursing programs. An appendix of Online Resources provides quick and easy access to web sites that will assist both students and graduates with continued study and real-world advice.